Syngonium podophyllum or Arrowhead vine is a fast growing, trailing or climbing tropical plant. It is a very common office and house plant and is often used in hanging baskets. ‘White Butterfly’ is the most common variety. 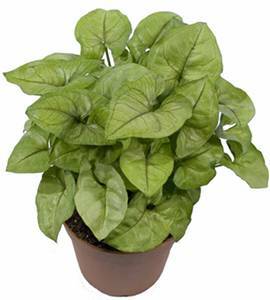 The leaves are an elegant pale green colour with a creamy coloured centre. Recently new cultivars have become available. ‘Neon’ has delicate pink coloured leaves, and ‘Mango Allusion’ has leaves with green and pink tones. Although this tropical plant is quite easy to care for, it does require more frequent pruning than most indoor plants. It tend to get thin and ‘leggy’ when not pruned. It will grow very full and bushy if the long trailing stems are removed regularly. These stems can easily be used to propagate new plants. Place the cuttings into water and they will quickly develop roots. Several rooted cuttings can then be potted together into tropical plant soil. The Arrowhesd vine prefers a humid environment. In the dry winter months the tips of the leaves may turn brown. Water well, but only after the top of the soil has dried. The roots will quickly rot if overwatered, ir if the soil does not drain well. Regular fertilizing will encourage strong roots and foliage.